Ilikai Lite offers outstanding value in the historic Ilikai Hotel. This Waikiki hotel offers stunning views of Oahu's shoreline and mountains right from comfortable rooms with conveniences such as kitchens and balconies. The hotel offers direct beach access, as well as a private path to Duke Kahanamoku Lagoon. Indulge at Sarento’s at the top of the Ilikai, where you'll be treated to panoramic views of Oahu's southern coastline, blue stretches of ocean, and fiery Hawaiian sunsets. 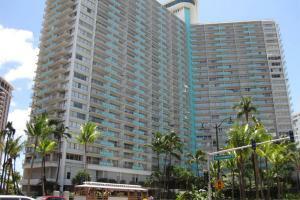 Located in Waikiki, just moments away from the beach.